Want a more positive outlook on Life? Do you wish your life was more positive and fulfilling? Look no further. This book (and the supporting mobile app / website) provide access to a set of resources that will help you jump start your life daily and live a more empowered and positive lifestyle. 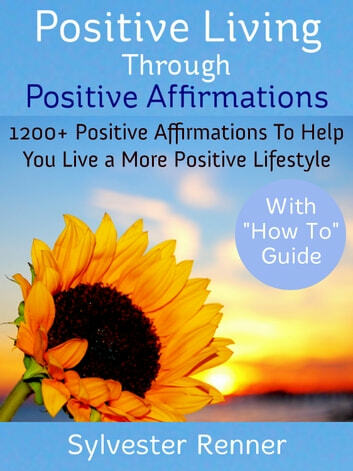 The book contains over 1200 positive affirmations covering a wide range of categories that will help you re-program your mind. Reading and meditation on a few positive affirmations each day and throughout the day will help you start and continue each day with a much more positive approach to life. The positive affirmations help you revisit your perspective and approach to life and renew your mind. Thinking right will change your attitude, affecting your subconscious mind. This will lead to a change in your habits, lifestyle, mental attitude / perspective, and reactions, and finally transform your entire lifestyle. Our mind is one of the most powerful influences in our lives and this will help you set a positive course for your mind. Meditating on these sentences is sure to help you adjust your attitude and reinforce your positive perspectives. The affirmations are conveniently organized into over 75 categories. This makes it easy for you to find, go to and meditate on affirmations for specific areas. The affirmations cover just about every category - such as Attitude, Abundance, Family, Goals, Health, Positivity, Self-Image, Success etc. We recommend you read it several times or throughout the day for a quick boost or lift. Stop several times a day for just 30 seconds and take a quick booster shot. This will help completely root out wrong and destructive thinking patterns and establish / replace them with uplifting, energizing and empowering perspectives on life. It is like taking medicine each and every day. Conveniently organized Into Easy to Find Categories: The affirmations are organized into categories. This makes it easy for you to find, go to and meditate on affirmations for specific areas. As you read and meditate on specific affirmations you will experience a shift and renewal in your attitude. The affirmations cover just about every category - such as Attitude, Abundance, Family, Goals, Health, Positivity, Self-Image, Success etc. The book is more than just a collection of affirmations. It also includes 2 bonus features / chapters: Firstly, a “How to Guide” that walks you through the process of using affirmations or making affirmations a part of your daily life. Secondly, the author shares his personal journey with affirmations – the role that they play in his life, the limitations of affirmations and the need for going deeper - developing a relationship with God. It has all you need to upgrade your life and live a more positive lifestyle. At its affordable, give-away price, this is a must-buy book! Purchase this ticket to a more empowered lifestyle and you will be glad you did! Learn the Multiple approaches are necessary to address the different issues that we all face as tri-partite beings. Very heavy on faith and God which makes it very difficult to use any of the affirmations if you don't believe in God.